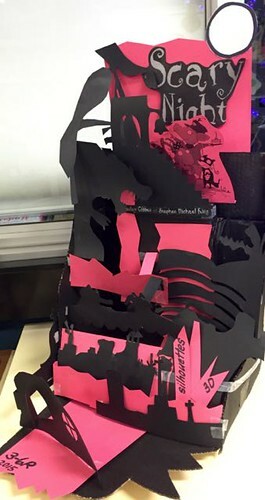 Book Week displays come rolling in! 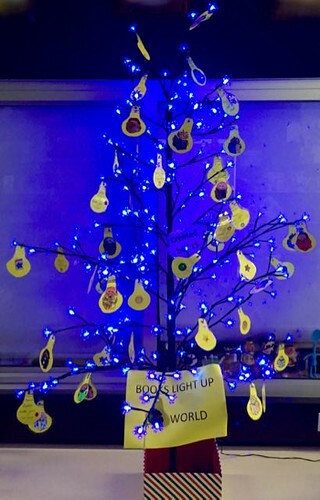 Click HERE for a slideshow of each class display. Lesley wrote, “Thanks so much 3-6R, your display is amazing! Have a wonderful Book Week celebration!” And then, a courier arrived, with free copies of Scary night for the creators! 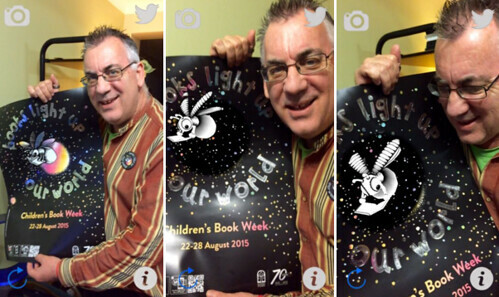 Make sure to check out out the free Apositive phone app and make the CBCA firefly fly – and read, and wave! At Penrith Public School, the transition to Oliver (from OASIS Library) and the students’ interface, Orbit, had to be delayed slightly due to long-service leave. It has been a very busy year: in addition to volunteering to be a Lighthouse School – demonstrating implementation and integration of Oliver through action research – we have been celebrating our school’s Sesquicentary celebrations. We have also been adapting from a complete Collaborative Planning, Programming and Teaching Program (CPPT) K-6 to the teacher-librarian providing one hour of Release-From-Face-to-Face (RFF) teaching for each class teacher. Despite these hurdles, I am committed to continuing to involve most Stage 2 and Stage 3 students in the Guided Inquiry approach and collecting data on student learning with the tools of evidence-based practices. 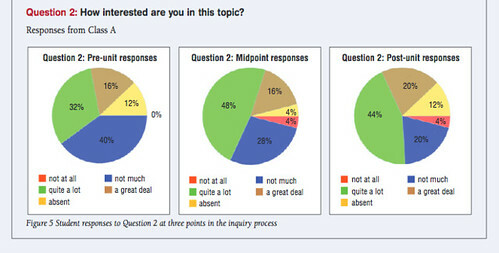 Because the RFF program had to commence in Week 2 of Term 1, and it was not yet decided on just when the Oliver transition would occur, it was essential that I continue to collect quantitative and qualitative data using the SLIM tool kit survey forms (School Library Impact Measure, designed by Todd, Kuhlthau & Heinström, 2005). I highly recommend the collection of such data for all Guided Inquiry activities. 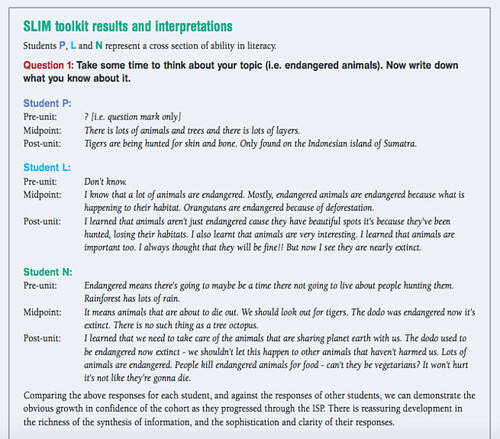 Surveys (as adapted for each unit from the template) are routinely filled out by students at pre-, mid- and post- intervals, even if not all data is tabulated immediately. I know that some teacher-librarians prefer to use an abbreviated survey (the so-called “Skinny” toolkit, as adapted by Lee FitzGerald and others), I do like to have all the data on hand simply because one often doesn’t know what evidence might be required/requested in the future. For the two Guided Inquiry units started earlier this year – Stage 2: Built environments (science & technology) and Stage 3: Global connections (HSIE) – it became obvious, but too late, that the best way to integrate an introduction to Orbit would have been when locating relevant websites for research. By the time Oliver had arrived at Penrith PS, we unfortunately had already progressed past the Initiation and Selection stages of Guided Inquiry. (For the next time these units are taught, I need to ensure that all of the new and useful websites we found the hard way are represented in the new catalogue, so that students will achieve scaffolded success in their early searches). For the purpose of today’s presentation, I am drawing my examples of a previously-taught Stage 3 unit, Endangered animals, for which a full set (pre-, mid- and post-) of survey responses is already available. Above extracts (pp 31-33) are as featured in McLEAN, Ian. ‘Research columns: Taking the plunge: Guided Inquiry, persuasion and the research river at Penrith Public School’ in Scan 30(4) Nov 2011, pp 26-35. 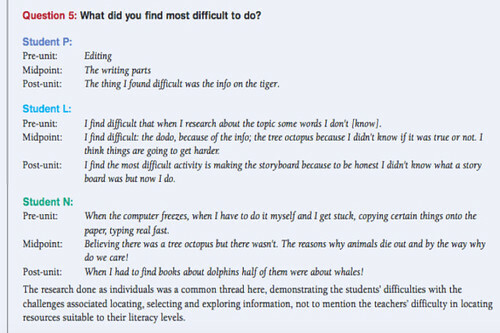 (Stage 3 students used a weblog to showcase their learning journey in Guided Inquiry, and to share their persuasive multimedia slideshows on endangered animals with the extended school community – and beyond. This action research paper is peer reviewed.) 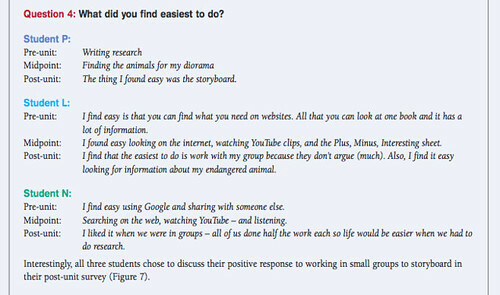 Download the whole article as a PDF from HERE, courtesy of NSW DoE’s School Libraries & Information Literacy. Todd, R.J., Kuhlthau, C.C. & Heinström, J.E. (2005). School Library Impact Measure: SLIM: a toolkit and handbook for tracking and assessing student learning outcomes of Guided Inquiry through the school library, Center for International Scholarship in School Libraries at Rutgers University (CISSL), New Brunswick, NJ. * Banks PS teacher-librarian, Julie Grazotis, has a wonderful ClassMovie video clip about their Oliver journey HERE. 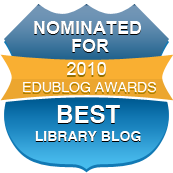 Other links to local preliminary Lighthouse School Library System projects are HERE.